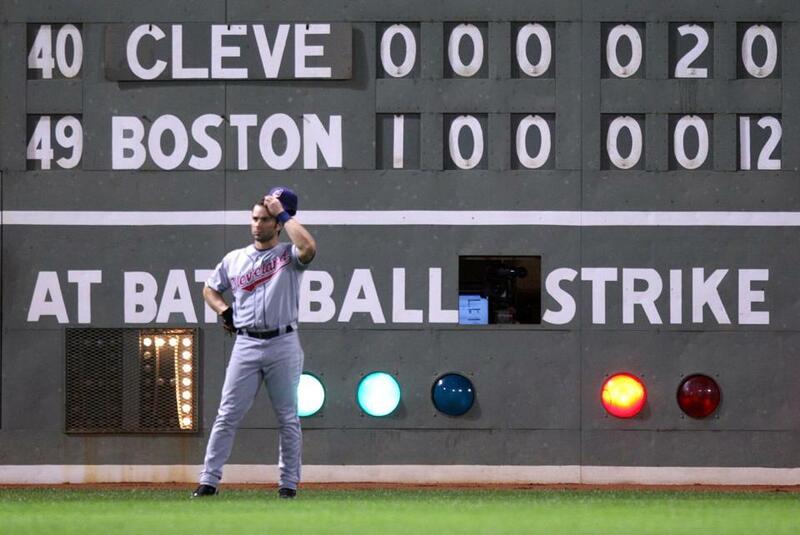 The Red Sox’ 12-run sixth inning hung on the left field wall behind Indians outfielder David Dellucci. The Red Sox hustled into their dugout after the top of the sixth inning last night, and this is what occurred next: single, walk, double, walk, single, walk, double, single, single, single, single, home run. Now read that line again slowly, and consider just what happened at Fenway Park last night in a 13-3 Red Sox victory before 37,541. Twelve batters crossed the plate before Indians pitchers - three of them - could record one out in the sixth. When Julio Lugo walked toward the batter’s box at 8:34 p.m., the Sox trailed, 2-1. When J.D. Drew grounded to second for the third out of the sixth 34 minutes and 21 seconds later, the Sox had an 11-run lead. Only one team in baseball’s modern era - in every game played between 1900 and last night - had scored 12 runs in an inning before recording an out. The Brooklyn Dodgers scored 12 runs before one out in the eighth inning against the Philadelphia Athletics May 24, 1953. The chin-on-the-ground inning overshadowed resurgent games by Lugo and Rocco Baldelli, and it underscored the Red Sox’ resiliency on a night they played with a diminished lineup. David Ortiz, who manager Terry Francona expects to play tonight, was a late scratch because of a stiff neck from batting practice. With Jacoby Ellsbury and Kevin Youkilis nursing injuries and Jason Varitek watching because Tim Wakefield pitched, the Red Sox fielded a lineup with four starters. “We were scrambling a little bit,” Francona said. Then they went out and set a record. Statistical oddities and feats tumbled out of the inning. The Red Sox hadn’t scored 12 runs in an inning since they scored 14 in the first inning against the Marlins June 27, 2003. Midway through the inning, some veterans on the Sox bench - including Mike Lowell, who played for the Marlins - started discussing that game. The starting pitcher that day, Carl Pavano, was also the winning pitcher Tuesday night. He sat in the Indians dugout and watched. Four RBIs make for a decent week. Jason Bay achieved that in one inning, going went 2 for 2 with a double and a three-run home run. Three batters - Lugo, Pedroia, and Bay - scored twice while the “out” lights on the Green Monster remained dim. Lugo had two hits since last Friday. He slapped two singles in the inning, and for the night went 3 for 5 with a triple from the leadoff spot. He also sparked the unending rally with a clean single through the left side. Pedroia walked, and Bay doubled home Lugo for his second of three runs. The Indians intentionally walked Lowell to pitch to Baldelli with the bases loaded. “Then they have to make a decision,” Francona said. The score still close, Indians manager Eric Wedge moved the infield in. The encroaching infielders made for easy lanes through which to line singles. The culprits wearing gray watched Red Sox batters circle the bases one by one, the cheers becoming louder and more delirious as each run crossed. Jeremy Sowers, who had allowed four hits through the first five innings, faced six batters and left with the bases loaded following a walk to Drew. If Sowers had dug a hole, Masa Kobayashi rode in from the dugout on an excavator. He faced five batters and allowed five hits. Matt Herges took his turn. Bay promptly smashed a home run to right-center, into the Red Sox bullpen. Herges retired the next three batters in order, a reminder that pitching matters, too. And the Red Sox received another quality start from Wakefield, who upped his record to 4-1 by allowing two runs in six innings. The best part about the sixth inning outburst, Bay said, was that Wakefield was still the pitcher of record. Wakefield has carried the Sox at times this season, and last night they helped carry him. Baldelli, making his first appearance since coming off the disabled list, made a pair of plays that would have made him the star. He saved a run with a sliding catch in center field in the sixth, when one run could have affected the outcome. He also gave the Red Sox the lead in the sixth with a two-run single to left-center. As it happened, Baldelli’s comeback night became a footnote, and the historic sixth inning may have overshadowed the importance of the victory. The Red Sox were teetering on the verge of a two-game sweep at the hands of a team that entered the series tied for the worst record in the American League. Instead, the Sox gathered momentum for another series against the Tampa Bay Rays and added another story to Fenway’s lore.